It’s smart to have a first aid kit available for your pets in case of emergencies. Accidents happen and you don’t want to be unprepared when they do. 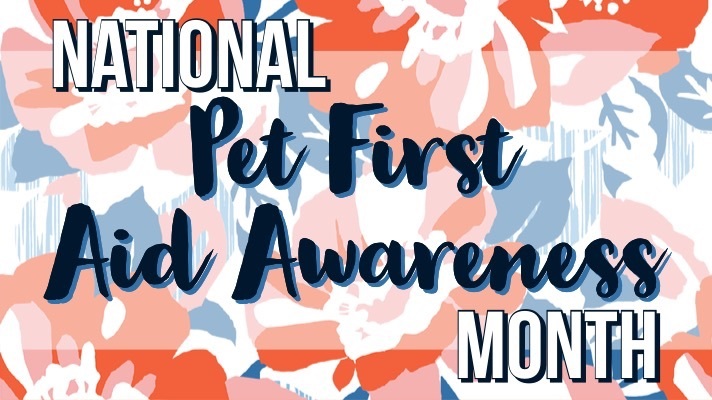 If your pet is injured or becomes sick, having a fully stocked first aid kit prepares you to take care of them until they can be seen by a vet. To ensure you have everything you might need if an injury or illness were to arise, we’ve prepared a list of supplies and created two free print-ables to go into your kit. Let’s go over some of the essential tools and supplies needed for your first aid kit. Keep in mind, this is a list of suggested items. You know your dog best. If you see something not on our list that you think your dog needs, feel free to add it to your kit. It’s important to remove ticks as soon as possible. The safest way to do this is with a tick remover tool. There are many options available in a wide price range. This is one we suggest. Slip leads are leashes that work by simply sliding the end of the lead into the metal ring located on the other side. Having one in your kit is important because it combines a collar and leash into one. A muzzle is important to have because first aid can be stressful on pets, a muzzle protects you and them while you perform first aid. Towels and blankets are important because they provide warmth to a cold/hypothermic dog or can be used as a makeshift gurney for moving your pet. They can also be used to restrain your pet while performing first aid. To administer medication or flush out irritants. Treats provide a distraction to your pet when performing first aid. They also improve your pets experience during first aid with positive reinforcement. There are many collapsible bowls available with a variety of designs like this one. Some nail injuries can be fixed by clipping or filing your pet’s nail. However, keep in mind that pets nails have quicks that can be injured if cut. Help cool your dog down with cold packs. Instant cold packs work best for first aid kits. Heat packs help your dog warm up. Instant heat packs work best for first aid kits. It’s important to keep to prevent contamination by wearing gloves when addressing an illness or cleaning a wound. Tweezers can be used to extract foreign objects from your pet’s skin. Flashlights provide a better visual when dressing an injury or wound. Here is one that can be worn on your head to keep both hands free. To make it easier to dress a wound, be sure to include bandage scissors or scissors like these. It’s important to keep a bottle of water in your first aid kit to wash off your pet or hydrate your pet. Gauze in a variety of sizes will ensure you have plenty to cover a wound. Vet wrap keeps gauze in place, as does tape. Band-aids are not an acceptable way to dress a wound for pets. Saline solution can be used to wash out wounds or eyes for pets. To apply disinfectant or antibiotic ointment, you can use cotton balls or q-tips. Cotton balls can also be used to clean a pet’s ear. Lubricant has multiple uses in first aid kits, including helping check pets temperatures and slicking down pet hair to give a better visual on wounds or cuts. Skin and paw balm is a good way to combat dry nose or raw paws. There a lot of balms on the market, including a Bert’s Bees product. Antibiotic ointment can be used to keep minor cuts and wounds clean. Hydrocortisone cream can help a pet with red or itchy skin. Dehydrated pets benefit from electrolytes just like humans, although, it is important that it be sugar-free for your pet. Styptic pencils or powder are used to stop bleeding and prevent infection. They are most often used when a pet’s quick is cut. The most common antihistamine is Benadryl. Your pet can have Benadryl if you notice itching or allergies. Benadryl can even be used as a calming supplement. Be aware that other active ingredients other than diphenhydramine can be harmful to your pet. For more information about proper dosages or what brand to use, consult with your vet. Hydrogen peroxide is an important compound because it induces vomiting in pets. This can be a lifesaver if your pet has ingested something toxic. Do not use hydrogen peroxide as an antiseptic on pets as it slows down your pet’s actual healing process. Povidone-iodine can be used to clean a pet’s wound. Here is one available from Target. If your dog is currently on any medications, be sure to include them in your first aid kit. Ear wash can be applied with a cotton ball or with an ear wash wipe like this one. Both of these items can be used absorb any toxic liquids your dog might have ingested. Pain management should be something you consult with your vet about as aspirin is not the preferred method of pain relief for a pet. However, aspirin can be given in adequate dosages. Under no circumstances should you give your pet pain relievers like Tylenol or Advil or any reliever with an enteric coating. They are harmful to pets. Dish soap like Dawn is effective for bathing your dog in many situations. The most common dextromethorphan is Robitussin. Consult with your vet regarding dosage and efficiency. Pepto Bismol can be given to your dog to relieve an upset stomach. Do not give Pepto Bismol to cats! It is toxic to them. Dramamine can be given to your pet to alleviate motion sickness but consult with your vet first. Glucosamine can be given to pets with arthritis. Glucosamine reduces inflammation. Check with your vet for proper dosage. If your pet has a security item, feel free to include it in your first aid kit to provide comfort for your pet. For diabetic pets, a sugar supplement can help control blood sugar levels. Booties can be used to protect pet feet in unsafe environments or after a foot injury occurs. When you’re done dressing a wound or caring for an illness, it’s best to sanitize your hands. 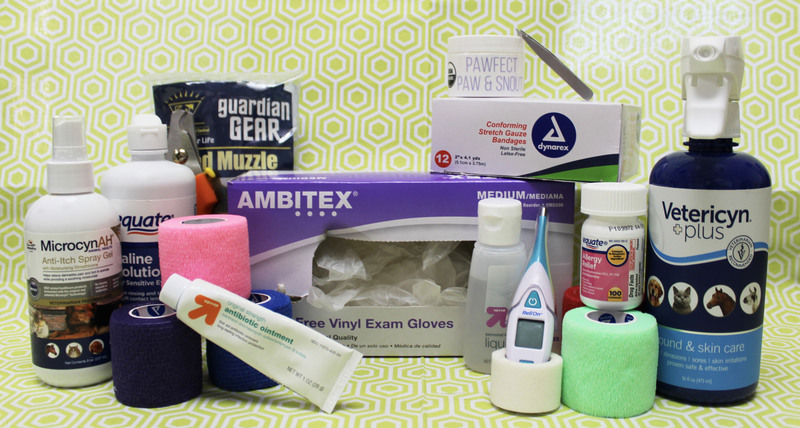 When you finish prepping your first aid kit, be sure to take a look at our Top Ten Things Needed In Your Pet Emergency Kit to learn more about emergency/disaster preparedness.